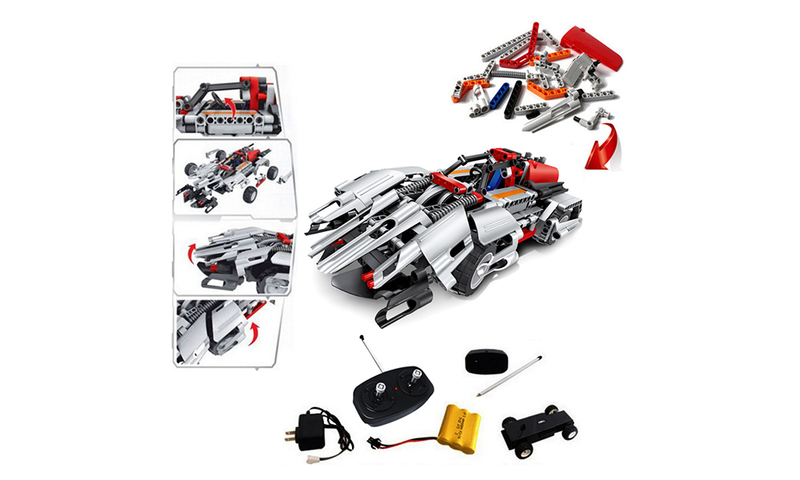 With a cool assembled building block remote control car, the children's childhood is more colorful. 1. The characteristics of science and technology building blocks are that the built toys are more solid, more expandable, and more realistic and modern! 2. 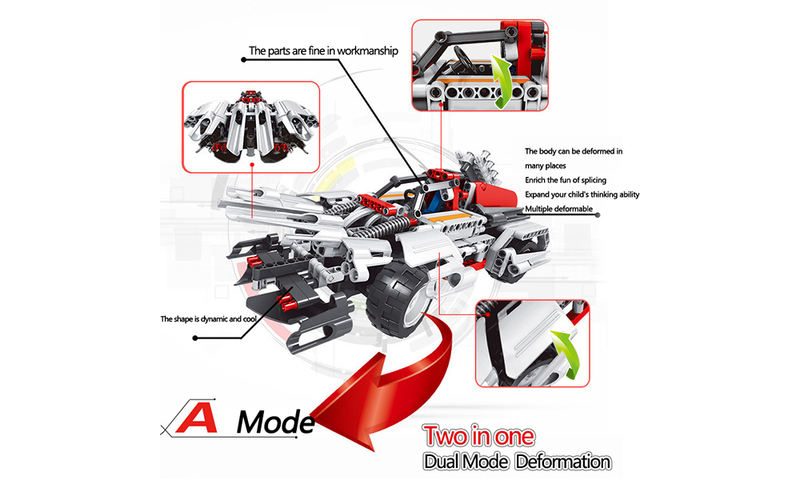 Spelling double mode: the whole box of hundreds of technology building blocks can be assembled into two kinds of remote control cars, so that children can fully exert their imagination in the process of assembling, interlocking. 3. The body is equipped with a USB rechargeable battery, the original rechargeable battery is equipped with a USB charging cable, charging only two hours, anytime, anywhere you want to charge. 5. Chassis fine-tuning, shock absorbers. The bottom fine-tuning function adjusts the front wheel angle for different terrains and environments, allowing the child to better control the remote control car. 6. The rear wheel is equipped with a shock absorber to avoid the shock of the remote control car when bumping and driving at high speed. 7. The parts work fine, the shape is dynamic and cool. The body can be deformed in many places, enriching the fun of spelling and expanding the thinking ability of children. 8. 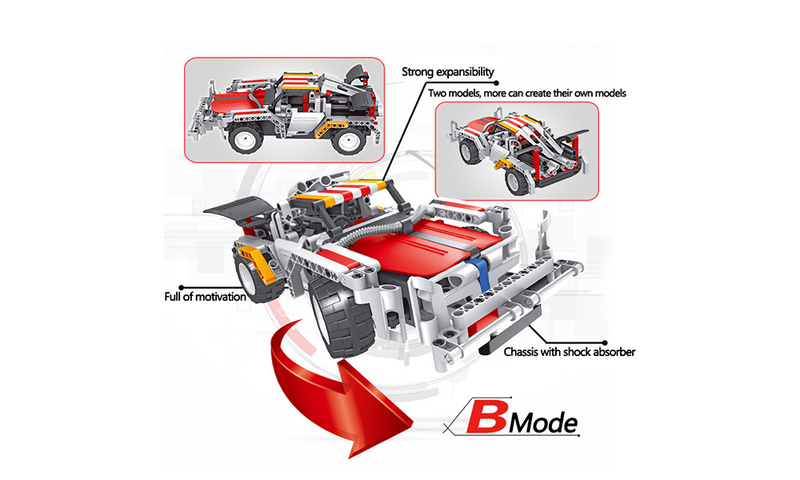 Strong expansion: two modes, you can create your own shape, and according to love you have high compatibility, the chassis with shock absorbers. 9. External charging, to avoid unpredictable problems and faults caused by direct charging of the product, more safe and convenient. The charging plug is a USB cable, plug in the computer power plug, mobile power can be, charging can be as short as 2 hours. It's a DIY assembly block, and you can make it a cool car. When you assemble it, it's a remote control car.